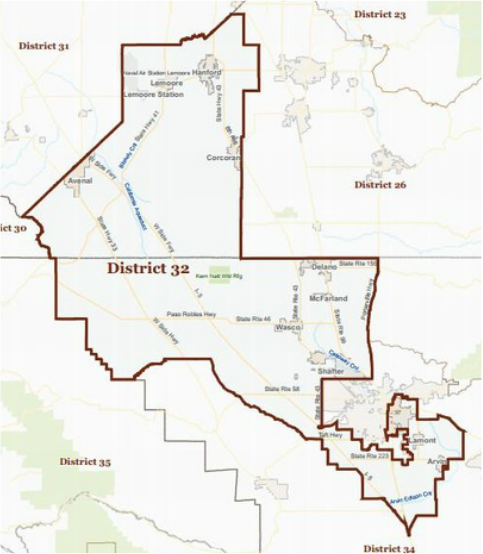 Democrat Rudy Salas currently represents Assembly District 32 and will not be termed out until 2024. Salas is expected to easily win re-election in 2016. Since being elected, Salas has already made his mark fighting for jobs, education, water, veterans, and health services for the Central Valley. Salas co-authored the Water Bond with $7.545 Billion for safe drinking water and storage project, giving California the ability to store water for use during dry years; saved funding for Ag Education programs such as FFA; authored a Hospital Authority Bill to save the local Kern Medical Center; secured $15 million in the budget for job training; helped secure millions of dollars for local schools; kept our neighborhoods safe by leading the charge to re-open local community correctional facilities and shut down illegal gambling cafes; protected veterans from discrimination and fought to tackle veteran homelessness; passed legislation to bring more doctors into the Valley; and spent countless hours volunteering and meeting with local friends and neighbors to make a difference. Assemblymember Salas currently serves on the following Assembly Committees: Accountability and Administrative Review; Agriculture; Governmental Organization; Veterans Affairs; Chair, Regional Approaches to Addressing the State’s Water Crisis; Chair, Workforce and Vocational Development in California; Member, Renewable Energy Economy in Rural CA; Member, California Workforce Investment Board.